You’ve finally decided to join the bandwagon of cultured home theatre fanatics and are ready to get the best projector screen for your home entertainment. It’s about time you got one. But don’t worry, you aren’t late to the party. There’s always more room. Whether you want to magnify your gaming adventure, splash a movie across a massive white wall in the evening with your family or have slides or photographs from your mobile device to a 100-inch plus screen, a good projector screen should be your top pick. But why a screen projector and not your regular TV? You ask. Simple. When you need to binge-watch that loved Netflix series or the Manchester United vs. Arsenal game, your TV won’t be sufficient. And that’s where the best projector screens come in. Although you’ll need to buy the projector separately, the 100 plus inches of the projector screen can only be defined as pure bliss. Projectors are made for serious home theater zealots, people who want more than what the ordinary TV can offer. Here’s our list of the ten best screen projectors available in the market today to get you ready for the next series of Game of Thrones. As one of the best projector screen manufacturers, Elitescreens offers value for your money. 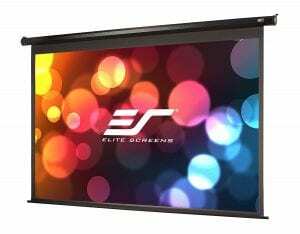 That’s why the Elite Screens ezFrame projector screen tops our list. With this screen projector, you have 135 inches of viewing space. What’s more, with a 16:9 ratio, your view of any type of file will be fabulous. With a 4K Ultra HD and an active 3D projection ready, nothing prepares you for the amazing experience you are bound to have. The projector screen’s frame is coated with black velvet that helps increase the picture contrast as well as absorb the projector’s overshoot. Setting up this screen projector is quite easy as there are only six pieces that you’ll need to assemble. In addition, the manufacturers have added a sliding wall bracket that helps slide the screen projector in a horizontal manner hence sitting properly in the center of the wall. The screen material is made from AcousticPro1080P3 that makes it acoustically transparent providing a viewing angle of 160-degrees. The transparency of the AcousticPro material makes it suitable for a rear-speaker set-up or hidden-speaker set-up. This makes it breathable giving you a more authentic audio experience. The reproduction of a real-world color is made possible by the matte white surface that gives an amazing color quality. With a two-year warranty, there’s no reason whatsoever why this projector screen shouldn’t be part of your home. 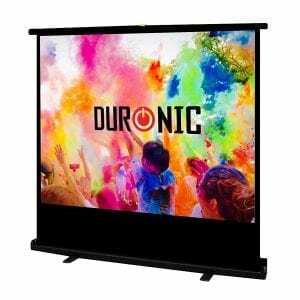 If you’re a Game of Thrones lover and enjoy it best with a group of friends or family, then the Duronic Projector Screen should be your next buy. As a portable projector screen, the Duronic wouldn’t have missed our list of the best screen projectors worth buying. The screen easily lowers and raises into a roller case making it portable. That way, you can carry it along to a friend’s home or your kid’s room for a late-night movie experience. Its portability is made possible by a carrying handle and weighs only 1.3kgs. Besides, the screen is HD and 3D as well making it perfect for a both home, office, and classroom use. The super white matte used in designing this screen makes it thicker and whiter than most screens in the market. Besides, it’s compatible with all types of 3D or HD projectors. 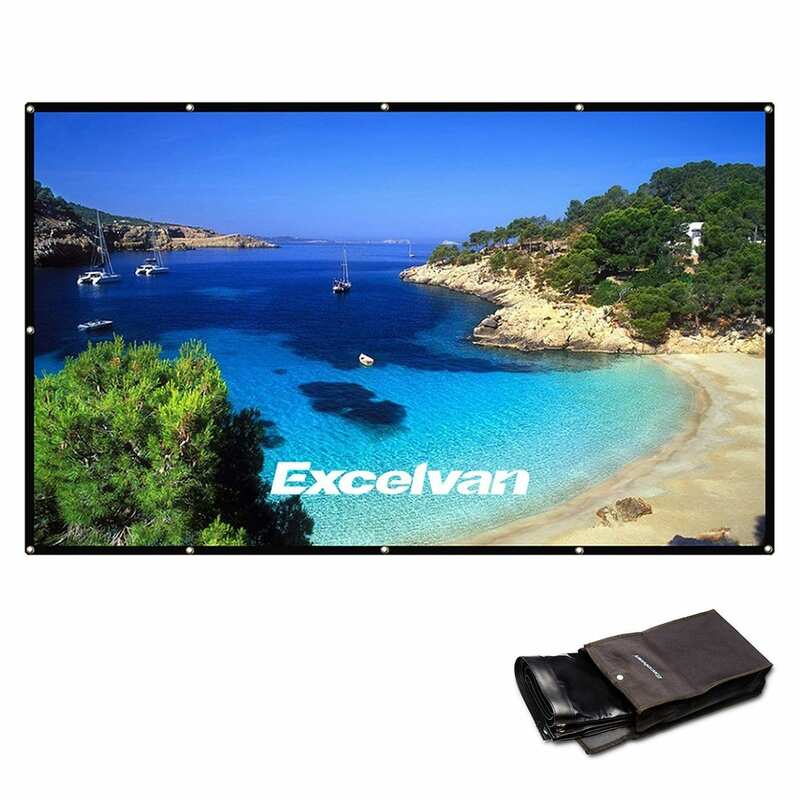 With a 4:3 screen, this projector screen can fit perfectly on your wall. Its set-up is also east and won’t take much of your time. 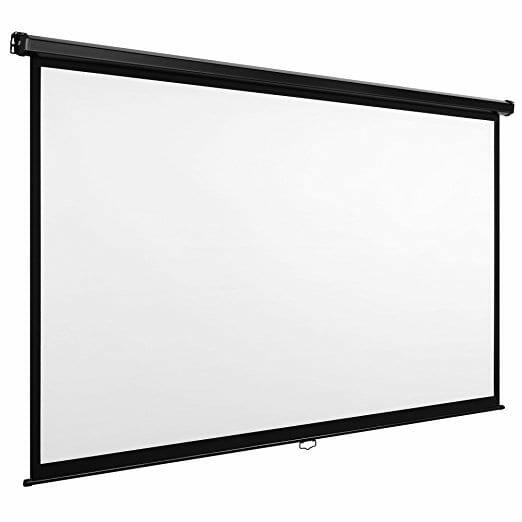 With a 120-inch screen viewing area with 160-degree viewing angle, the Homegear projector screen can be used either at home or at the office. The black edge frames that are 3cm for the viewing area, offering the needed contrast when viewing. Moreover, the screen will enable you to view very vibrant and clear pictures as it comes with three black baked screens. 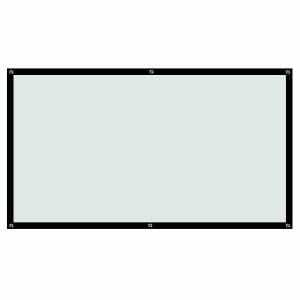 Its durable screen construction enables you to easily mount it to the wall. But its greatest advantage is the remote control that enables you to control your screen quite easily hence minimal movement from you. The screen can also be easily cleaned by using soap to wipe and comes with a masking border that’s used to enhance the picture contrast. If you are looking for a multi-purpose projector screen, the VonHaus is one of the best projector screens to fulfill that function. You can use it both at work in the office or at home for watching movies or your favorite series. You can also use it to wow your clients with that awesome PowerPoint presentation. 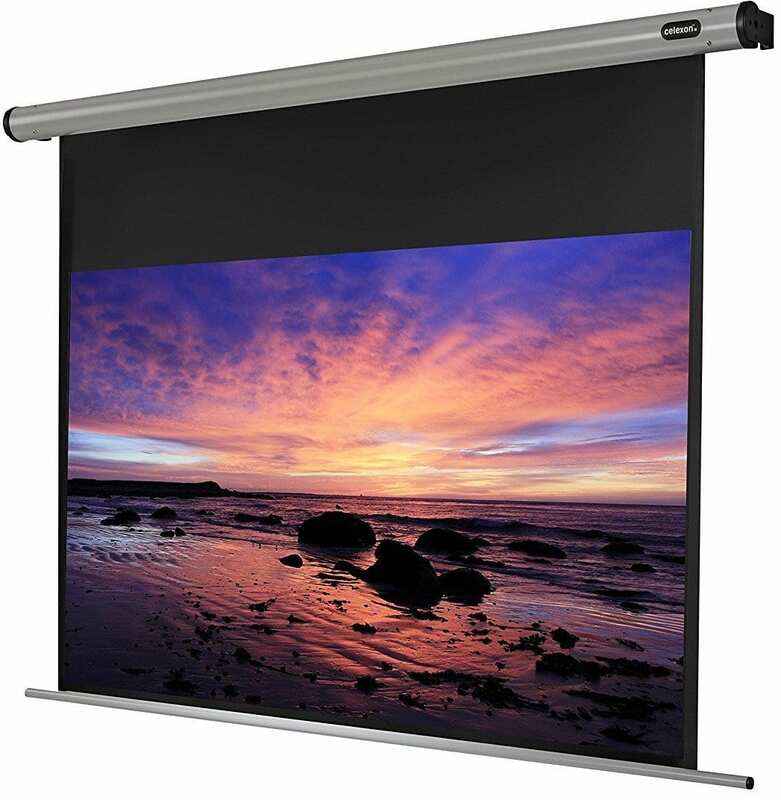 The VonHaus projector screen can be mounted on a wall or ceiling using anchors and screws. The mounting holes make it easy to dismantle the construction with zero effort. This projector screen is fully manual. As such, all you will need to do is pull it down using a handle. Worried about it rolling back up? No need. It has a self-locking mechanism that keeps it from rolling up. The black borders that are part of its built help improve the contrast ratio. That means you will be more than happy with the images on the screen. And if you are a lover of high definition pictures, then the 16:9 aspect ratio will be more than welcome. The screen has a gain factor of 1.1 that helps minimize light reflection. 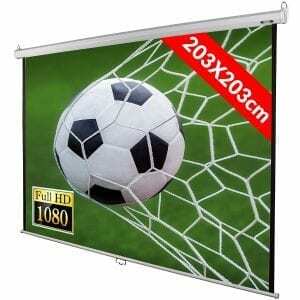 Besides, the manufacturers are super confident in their projector screen that they offer a 2-year warranty. If you are in the market for an easy to use screen, then you can’t go wrong with the Jago BELE01. It’s quite easy to mount on a wall using anchors or screws and then pulling it down and enjoying the big game or your truly awaited series return. 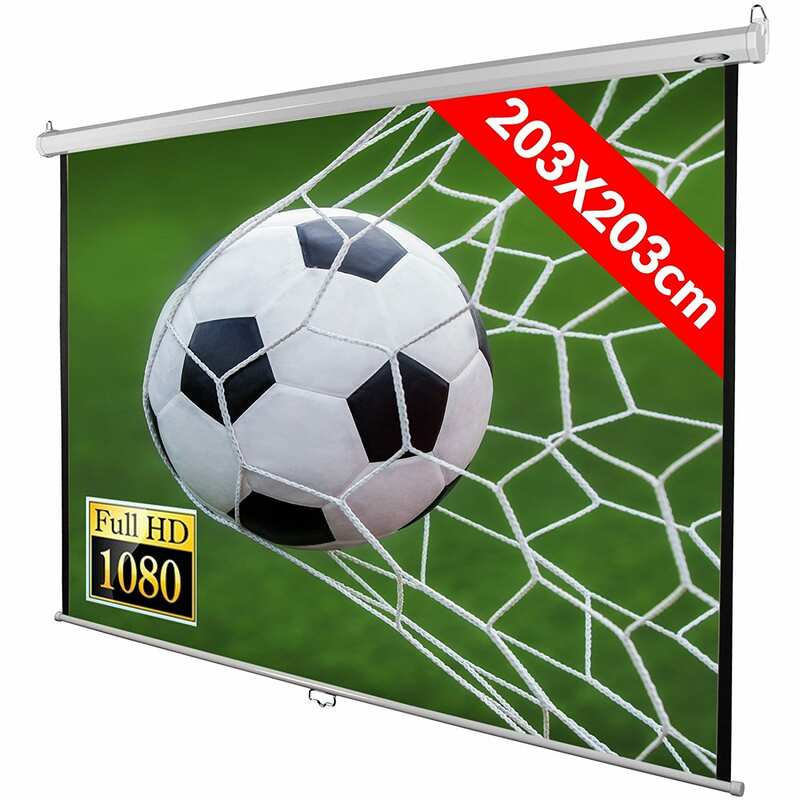 Depending on the screen length, this projector screen is available in different sizes that include: 1:1, 4:3, 16:9 among others. The screen has a three-layer that combines a dense fabric that has a vinyl covering making it crease resistant. Besides, the screen is HDTV ready due to the black frames on the side that provide a much better contrast ratio. Moreover, the matte white screen for this projector screen has a gain factor of 1.0 which makes it suitable for your home. 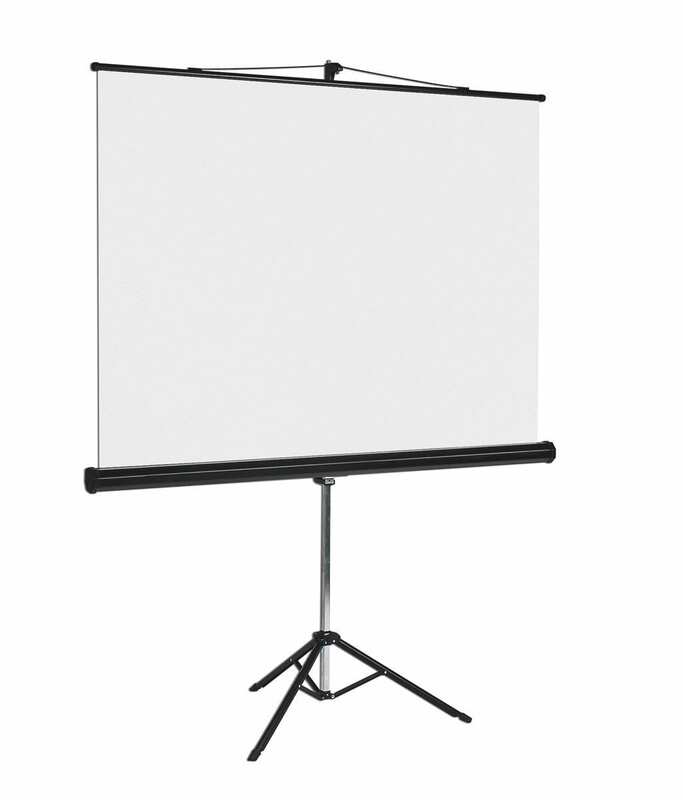 This projector screen from Celexon has a modest and sophisticated design with a slim frame of only 29mm wide. The frame has a black velvet finishing that has a depth of 10mm. This helps maximize the viewing area and reduces the edge reflections. It has a unique fabric – a nano-diamond structure – that’s been designed specifically for it which allows it to offer a superb image quality, drenched colors and helps eliminate any unnecessary reflections. The cloth enables it to offer high definition resolutions of more than 4K image quality. Besides, the matte white screen has a gain factor of 1.0 that has a viewing angle of 160 degrees. This makes it perfect for your home or office set-up without it being bulky or overpowering. Regardless of where it’s used, its high-quality design, as well as its sleekness, makes it a sight to behold. With the aid of springs, the fabric is able to stretch inside the frame to guarantee its firmness. 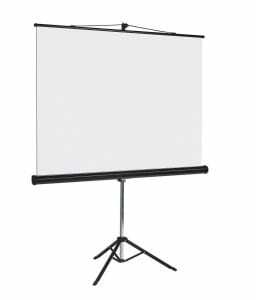 The Excelvan screen projector is one of the projector screens if you are looking for something that’s portable and can be used both at home, in the classroom or in a conference room. 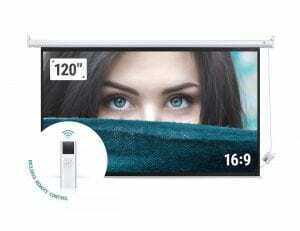 With a viewing angle of 160 degrees and a screen aspect ratio of 16:9, the images displayed on the screen will be beautiful, vibrant and lively to watch. The screen material is made from a PVC composite resin that is smooth with a surface that’s non-deformable. The white matte screen also has a gain factor of 1.1. This screen is quite easy to set up. However, when opening the package, be careful so as not to wrinkle it. It’s light in weight and uses hanging holes for an easy setup. Additionally, it can be spot cleaned using water and mild soap. However, abrasives should not be used as they will damage the screen. With a 104 by a 58-inch screen, this screen offers you a much-enhanced viewing compared to that of a regular TV. This projector screen has an HD matte white screen with a gain of 1.2 which allows you to have a great colour contrast as well as images that are sharp and bright. The screen material is also triple layered and is designed from black PVC, white PVC, and Terylene fabric. The 120-inch viewing space also makes it a plus for your home. Depending on your viewing, the BPS screen projector has two viewable aspect ratios – 16:9 and 4:3 – with a viewing angle of 170 degrees. The black borders enhance the focus and contrast of your picture. In addition, it’s easy to install and can be mounted either on the ceiling or on the wall and works perfectly with all projectors. It has an RF remote control that makes it easy for you to operate it. It has a high-quality motor whose design equals no noise. With all the features available on this projector screen, what more would you want? If you are in search of a projector screen that’s suitable for public displays, home theatre, office presentations as well as classroom training, then the Build Excellent is your answer. The matte white viewing surface material helps diffuse the light projected uniformly leaving you with a perfect colour reproduction as well as an amazing visual enjoyment. 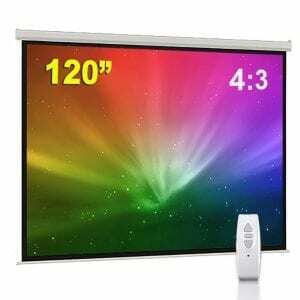 With a screen inch of 100 inches, you get a viewing area of 87 by 49-inches and a screen format of 16:9. Besides, the matte white material has a gain of 1.1 which can be cleaned using soap and water. However, do not use abrasives as they’ll destroy the screen. The best part is that it’s easy to install and disassemble. If there’s a projector screen that’s by far the easiest to set up compared to all the ones listed in our review, it’s the Bi-Office projector screen. It has a free-standing tripod that’s sturdy hence no need to worry your head about it falling. The steel case is also quite durable combined with a carry handle and chrome legs. The matte white surface has a flame-retardant material that can be used with a screen format of 16:9 as well. The screen is also reflective making the projected images look superb. And if you are worried about quality, well you don’t need to. For its price, the quality is definitely on another level.